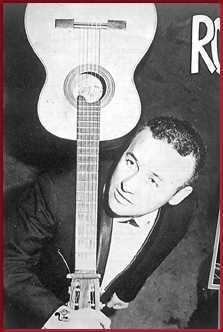 Rolando Alarcón was a Chilean singer/songwriter of the 60s and early 70s. I heard some of his music when I lived in Ecuador in 1967/8 - my mother Alice had a tape of it, courtesy of some local Peace Corps workers who had traveled to Chile. We listened to it over and over. I loved the songs, and they have haunted me ever since. Alarcón's lyrics are romantic, humanist, patriotic, profound and beautiful. His music blends a strummed-guitar folk sound with the drums and panpipes of indigenous Andean music, and the harmony is fresh and creative. The overall sound is unique. Alice says: "As a folk poet as well as a musician, Alarcon beats Dylan all hollow." As great as I think Dylan is, I have to agree with her. A year ago, after an unsuccessful attempt to copy the old reel-to-reel tapes to CD, I started looking for the music on the Internet. Finally, thanks to my friend Emilio in Barcelona, who asked his friend Leonardo in Chile, I tracked it down and got a copy on cassette. The release is called "No Juegues a Ser Soldado". After many late nights (and many tears) I completed a web page of No Juegues a Ser Soldado with the music (in MP3 form) and the lyrics in Spanish and English . If you have, or know of, any other Alarcon recordings, please email me. With all the technology in the world, I think it's criminal that great and historically important music can disappear forever, to be replaced by a million pressings of 'N Sync, etc. Many thanks to Kristina, who supplied most of the MP3s. Lyrics to all of Alarcón's songs are on Trovadores.net.